I wanted the background to be like the activation of the Tsukuyomi, So I had to work really hard to make it appear to be SUCKING YOU IN. After making sure everything was crisp and clear, while retaining the amount of blurriness I needed for the effect...then I moved on to the next piece. The Mangekyo....It took me forever to get the coloring just right...(color coordination is a big piece of this wall)) When I first added the finished product to the wall, I realized they were really flat...so I gave them each a ripple effect, and ghost effect to fade them into the background, as though the ability really is being activated. 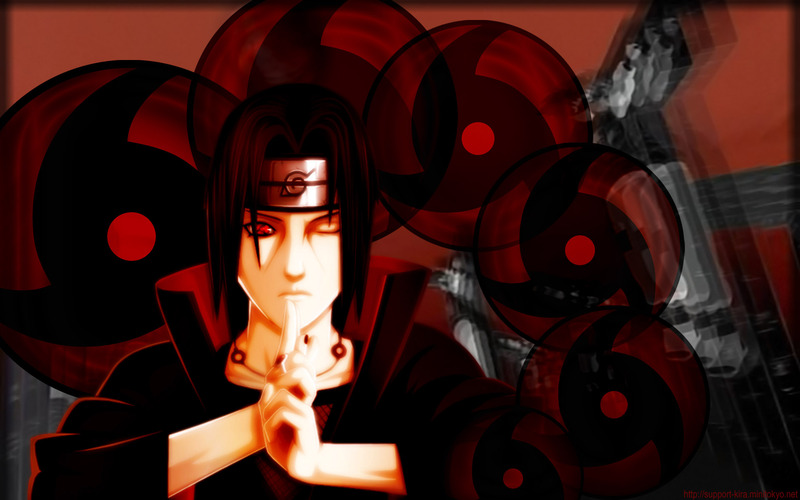 :) I then added more and circled them around the space I wanted Itachi. When I placed him on the wall, I added a couple of the mangekyo to the forefront. Then went to work on the background frame. I painted the rim with a brush, then blurred it as well for the desired end. Browse Itachi Uchiha Gallery: Recent | Popular.